Firenados are scary, dangerous and even mysterious at times. The whirling flames can destroy the entire city in a matter of a few hours. While tornados are dangerous, firenados causes more harm, because volatile embers can be quickly distributed long distances, causing new fires and whirling flames. Firenadoes typically move slower than tornados but they cause strong fire winds that are very hard to extinguish. Here are some of the most dangerous firenados ever. This photo of firenado was caught by Janae Copelin in Missouri. Even though it was not a natural disaster, the firenado looks really dangerous. In reality, this swirling funnel of debris, gas, and smoke occured when a farmer was burning the field. The wildfire in California turned into a real hell. This firenado was not just scary, it killed many animals and destroyed everything on its way. So sad. A wildfire that spread to more than 4,000 acres created a crazy firenado. It was captuted in Refugio Canyon. I have no idea where this firenado happened, but it looks intimidating. Luckily, no serious injuries were reported, yet the firenado destroyed at least three buildings and many people, particlularly college students, were evacuated. Brazil has some firenados too. This one does not look as dangerous as the previous ones, but still it could destroy everything neraby. This video shows how exactly a firenado occurs. It was recorded on September 11, 2012 by Chris Tangey. It was probably hard to film it. It is so heartbreaking when you can’t prevent a disaster. This is one of the most dangerous firenados ever that over 600 state and federal firefighters were trying to control and extinguish. It caused evacuation of 1,600 homes. 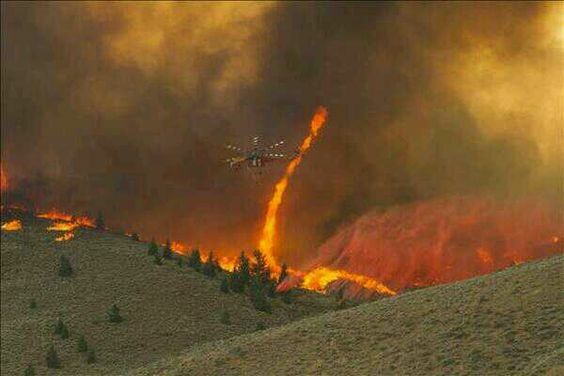 In most cases, firenados last only a few moments, so it is not easy to catch them on camera. It was not easy to find true firenados, but hopefully now you know how dangerous firenados are and how they look like. Have you ever witnessed a firenado?